> A Monodiet with apple ! Layering is the traditional ritual from Japan. The quest for perfect skin is ubiquitous in Asia where the skin must be smooth, plump, radiant with health. This is the famous mochi skin, in reference to the Japanese white rice cake. In Asian countries, beauty is synonymous with purity. The skin must be clear, luminous, soft and velvety. Over the centuries, women have adopted gestures and techniques that allow them to sublimate and have an irreproachable complexion. For this, she uses several beauty products. But that's not all. They are also followers of layering, a beauty ritual extremely common in Asia, but still little known in France.. It is a ritual in 6 stages of care that is transmitted from generation to generation in Japan. It consists in superimposing several products in a very precise order so that each new gesture neutralizes the disadvantage of the previous one and potentiates the benefits. Aline Foulet, founder of the Akane brand, shares her layering routine, 100% organic, made in France. "I have been doing layering for a little over 2 years and I could not do without it. Soon my skin was brighter, more homogeneous, more plump. I like the idea of ​​this routine developed with organic care, without petrochemical ingredients. It is also a moment to oneself which one quickly becomes hooked "
It is therefore a question of taking your time to look after your skin while favoring natural cosmetics. With this traditional Japanese method, one offers a pure moment of well-being. And to succeed in this care, it is important to choose the right products. Indeed, we can not apply any cream. They must also be used in the right order to take full advantage of their benefits. Above all, know that they must respect the skin of your face. Hence the advantage of opting for organic cosmetics, which do not attack your skin and do not contain harmful substances. 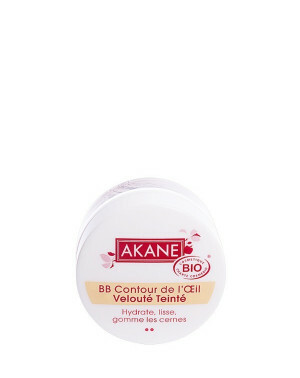 At Akane, we recommend several references from our ranges, which are made with natural ingredients and active ingredients. There is the cleansing and purifying oil, a soap or cleansing gel, a lotion, an eye contour, a serum and finally, a day cream. In fact, we start by cleaning the skin, remove impurities and hydrate to the maximum. It is therefore a make-up removal in depth. In Japan, women perform these actions daily. But if you do not have the time or the desire to do it every day, it does not matter at all. You can adopt Japanese layering once a week for example, or on weekends when you have more time for you. This should not become a constraint but remain a pampering moment of well-being. Do you want to try this technique? Here are the steps to follow to master the layering. We also tell you which products and accessories are suitable. So do not hesitate and let yourself be seduced by this ritual! Still little known in France, the oil makes it possible to perfectly remove the eyes, the lips and the complexion. Ultra efficient, nothing resists even waterproof makeup. Goodbye panda's eyes. The skin remains supple and perfectly comfortable. 1 - Apply 2 or 3 doses in the palm of the hands, dry. Spread on the fingers. 2 - Apply on dry face and gently massage with fingertips to dissolve makeup. 3 - Rinse 2 or 3 times with lukewarm water. 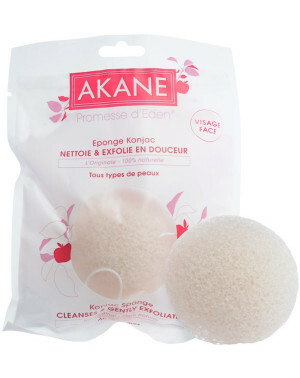 4 - Sponge the moistened Konjac sponge with circular massages. After the makeup removal step, the use of a soap or a cleansing gel cleans the skin thoroughly and eliminates any residue. 1- Apply 2 or 3 doses to the moistened Konjac sponge. 2 - Sponge the sponge on wet face to lather by performing circular massage. Avoid the area around the eye. 3 - Rinse with clear water. It helps eliminate limescale, soothe and reveal the radiance of the complexion. 1- With the spray spray on the entire face and décolleté. 2 - Gently wipe the face with a small towel. The area of ​​the eye contour is the most fragile, the skin is very thin and it is often there that appear the first signs of age, fine lines, dark circles. The trick in +: Leave the Serum in the refrigerator for a decongestant effect. It is a treatment that addresses a specific problem, and that activates the benefits of the day cream. 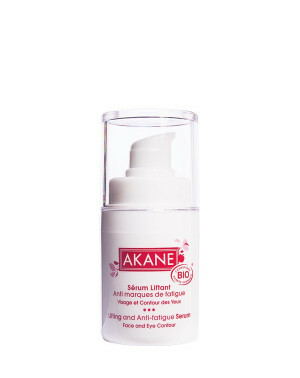 Enriched with pea peptide and black tea extract, Akane Serum improves skin texture, firming and revealing radiance. Cette étape permet d’hydrater et de protéger la peau quotidien et de lui apporter un soin spécifique en fonction de votre âge et/ ou de la qualité de votre peau. Enrichie en polysaccharides de fougères et extrait de vigna aconitifolia, la Crème soyeuse anti-rides Akane lisse immédiatement les ridules et prévient au jour le jour l’apparition des rides. En 7 min pour le rituel du soir, et 5 min pour le rituel du matin, prenez soin au quotidien de votre peau, apprenez à l'aimer, la chouchouter. Jour après jour, elle vous remerciera et n'en sera que plus belle! A cream with a soft texture like silk that smoothes lines and wrinkles. 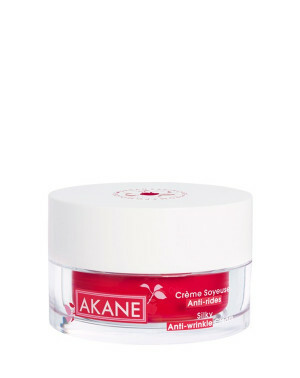 Its formula stimulates cell renewal and protects the skin from external aggressions for a lasting anti-wrinkle action. Paraben free, PEG free, silicone free, mineral oil free, phenoxyethanol free. Both serum and eye contour! In one gesture, its texture smooths fine lines, redraws the oval of the face, corrects dark circles and pockets to illuminate the look. The skin is firmer, smooth and plumped. Paraben free, PEGs free, phenoxyethanol free, silicone free. This Japanese sponge is made from Konjac tuber, exfoliates gently, cleans the skin of the face in depth and tightens the pores. Its formula enriched with pink clay is ideal for dry and sensitive skin. 100% natural origin and biodegradable. 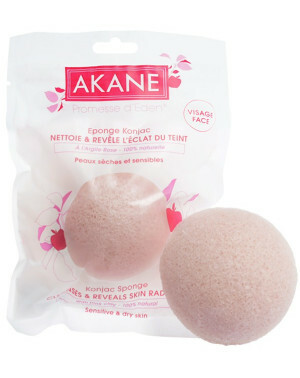 This japanese sponge is made from Konjac tuber, gently exfoliates, deeply cleanses the skin and tightens the pores. Suitable for all skin types. 100% natural origin and biodegradable. 1st step of layering. This purifying and cleansing oil Bio is efficient even on waterproof makeup. Leaves the skin supple and soft. 100% natural origin formula. 3rd step of layering. Enriched with ORGANIC rose floral water, this mist eliminates limescale residues, refreshes, soothes and reveals the radiance of the complexion. 100% natural origin formula. 2nd step of the layering. A fresh jelly removes impurities and cleans the face perfectly. Enriched with pure organic Aloe Vera juice, it soothes sensitive skin. Formula without paraben, without SLS, without PEGs, without silicone, without phenoxyethanol. An Organic & Detox back the school !